If you’re a Tick user with Admin permissions, you will now see a “Clients” option next to where you manage your users. 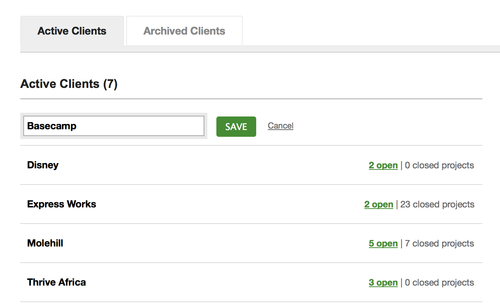 This new clients section gives you a way to quickly see how many open and closed projects you have for each client. And also a way to efficiently edit a client name, should it ever need to be changed. Another great benefit that comes from this client section is the unique ability to archive a client. When a client has no more open projects, you now have the option to remove that client from certain menus throughout Tick. 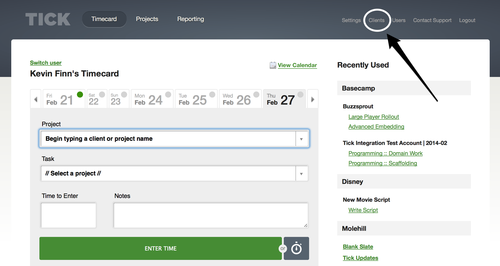 This keeps your project and reporting filters clean, making it easier to find the info you’re looking for. Even though an archived client won’t show in certain dropdowns, all the past client data like projects and time entries is still available in the reports and closed projects sections. If you ever need the information at a later time, you can always run a report and get it within seconds. And if you ever need to start a new project for an archived client in the future, simply make that client active again. The final thing to point out in the new client section in Tick is the ability to delete a client from Tick. This can happen in the rare event that you don’t have any open or closed projects for a client, Tick will give you the option to delete it from your client list. If you want to delete a client that has either open or closed projects, you will need to delete those projects from Tick before you’re given this option. So that’s the new client section in a nutshell. If you have any any questions, give us a shout; we’re happy to help.